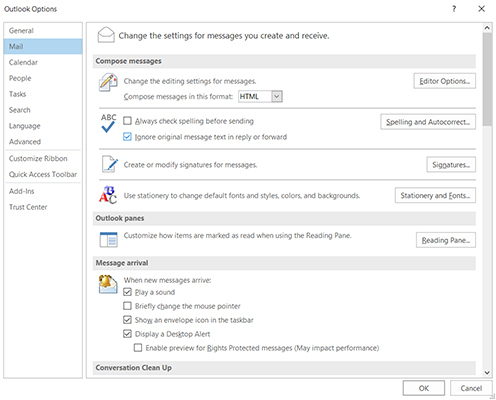 By default when an email message arrives in Outlook 2016, a bunch of things happen. 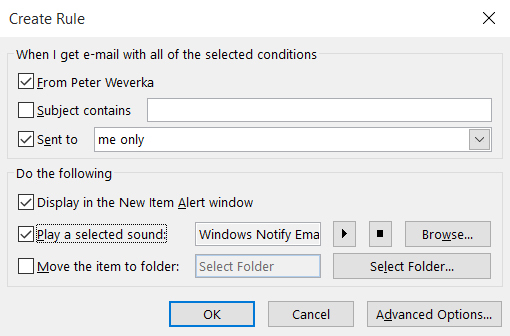 You hear a ding; a little envelope appears in the notification area to the left of the Windows clock; and a pop-up desktop alert appears with the sender’s name, the message’s subject, and the text of the message. Quite a fireworks show! But if you receive numerous messages, these email alerts can be distracting. Rather than be alerted whenever an email message arrives, you can be alerted only when messages arrive from specific people. You can be alerted only when the Master of the Universe or another important person sends you an email message. The messages appear in the New Mail Alerts dialog box, where you can select a message and click the Open Item button to read it. In the Message Arrival area, deselect all settings (Play a Sound, Briefly Change the Mouse Pointer, Show an Envelope Icon in the Taskbar, Display a Desktop Alert). Click OK to close the Outlook Options dialog box. Find a message from the important person and right-click it to display the shortcut menu. On the shortcut menu, choose Rules→Create Rule. The Create Rule dialog box appears. Make sure the first check box is selected. It lists the important person’s name or email address. Deselect the Subject Contains check box. To be alerted when the message was sent to you only, choose Me Only. Select Display in the New Item Alert Window to list the messages in the New Mail Alerts dialog box when messages arrive. Select Play a Selected Sound to hear a sound when messages arrive. Repeat these steps for each important person you know. To change or delete a rule, including a rule about new mail alerts, go to the Home tab, click the Rules button, and choose Manage Rules & Alerts on the button menu. On the Email Rules tab of the Rules and Alerts dialog box, select a rule, and then change or delete it.